The following is a list of 38 reporting indicators that split up across 15 different sectors and industries (including cross-cutting). They have definitions that have been agreed upon by 25 different international finance institutions from around the world, all of whom have signed the MoU on harmonized indicators. These indicators are also available for download in Excel format, and may be used by any entity wishing to use them. Prospective users are encouraged to register here to be recognized as official users and enjoy the benefits of such recognition (e.g., receive relevant communications, guidance on the use of indicators). Fifteen of the HIPSO indicators are aligned to IRIS metrics. IRIS is the catalog of generally-accepted performance metrics that leading impact investors use to measure their social, environmental, and financial performance. Click here to learn more about how IRIS and the HIPSO indicators work together. Definition: Average agricultural yield (per hectare) reported by the client during the reporting period. Value of export sales of the product or service over the reporting period. Number of farmers that are linked to the client company as suppliers, buyers, contractors or farming employees during the reporting period. Unit count (as applicable) and gross value of sales over the reporting period. Definition: Amount of money spent by the client towards activities that benefit local communities during the reporting period. Rationale: This indicator captures the breadth of development effects that IFIs desire to measure and is easily reportable by clients. It yields data that IFIs may use for further analysis on client contributions as they deem fit, including possibilities for referencing contributions for community benefit against total project cost, turnover, profit or total number of beneficiaries. However, establishing a threshold may be challenging since the level of contributions may vary by country, sector and the relevant market in which an IFI client operates. Non-financial contributions of the client are not captured by the indicator due to IFI challenges in ensuring all clients use the same approach to monetize their contributions to local communities. Number of full-time equivalent construction workers employed for the construction of the company or project’s hard assets during the reporting period. Part-time jobs for construction are converted to full-time equivalent jobs on a pro rata basis, based on local definition (e.g., if working week equals 40 hours, a 24 hr/week job would be equal to 0.6 FTE job; a full-time position for three months would be equal to a 0.25 FTE job if the reporting period is one year). If the information is not available, the rule-of-thumb is two part-time jobs equal a full-time job. Note: employment for the client company’s operations and maintenance is not to be included in this indicator. For such jobs, please use the indicator Direct Employment – Operations and Maintenance. Number of full-time equivalent employees as per local definition working for the client company or project at the end of the reporting period. This includes directly hired individuals and individuals hired through third party agencies as long as those individuals provide on-site services related to the operations of the client company. Also, this includes full-time equivalent worked by seasonal, contractual and part time employees. Part-time jobs are converted to full-time equivalent jobs on a pro rata basis, based on local definition (e.g., if working week equals 40 hours, a 24 hr/week job would be equal to 0.6 FTE job). Seasonal or short-term jobs are prorated on the basis of the portion of the reporting period that was worked (e.g., a full-time position for three months would be equal to a 0.25 FTE job if the reporting period is one year). If the information is not available, the rule-of-thumb is two part-time jobs equal a full-time job. Note: employment for the purpose of the construction of the client company’s hard assets is not to be included in this indicator. For such jobs, please use the indicator Direct Employment – Construction Phase. Definition: Client secures voluntary sustainability certification from an internationally- recognized certifying authority. IFIs who wish to gather additional information on the quality of the result reported may use ‘commentary’ to do so. All transfers to the government made by client company over the reporting period. At a minimum, this includes payments to the government in the form of corporate income or profit taxes. Additional forms of transfer to be reported as appropriate include (i) sales taxes, (ii) net VAT, (iii) royalties, (iv) dividends and related taxes, (v) management and/or concession fees, (vi) license fees, (vii) tax on payment of interest, and (viii) other material payments net of any direct subsidies received. Number of students enrolled at the end the reporting period, both full-time and part-time, where each discrete student is counted regardless of number of courses. Rationale: This indicator measures the number of people that could potentially benefit from the distribution of the IFI intervention. Data for 'residential connections' can be obtained from the client while data for ‘average household size’ varies by country and can be obtained from UN Demographic Yearbook data, which provides population size and total number of households for each country. If such data is not available, IFIs may instead use IFC’s ‘household multiplier’, which is standardized across countries. The conversion methodology may have the potential to be equally applicable to other sectors such as gas or water sector. Energy delivered to offtaker(s) during the reporting period. Include footnote about energy type(s). Definition: Average (simple mean) initial tenor (in months) of all outstanding loans in the applicable portfolio at the time of measurement. Rationale: This indicator provides specificity around length and nature of portfolio. Number & amount of outstanding housing loans in a client company portfolio at the end of the reporting period. Housing loans include all mortgage instruments issued for the purchase or re-financing of housing, housing construction loans and home improvement loans where the housing serves as the collateral to which the financing relates. Number & amount of outstanding microfinance loans (as defined by each IFI) in client company portfolio at the end of the reporting period. Note: An ongoing and separate study to determine global best practices for defining Microenterprises and SMEs is being undertaken by the Microfinance Exchange (MIX). Until a final recommendation arises from this ongoing study, the harmonization work recommends that the definition of Microenterprises and SMEs be left up to the IFI undertaking results tracking. This applies to both indicators for Microenterprise Loans and SME Loans. Number & amount of outstanding Loans to SMEs (as defined by each IFI) in client company portfolio at the end of the reporting period. Number of patient consultations provided by the client company during the reporting period. Number of residential dwellings (≥1 family per unit) refurbished by the client company at the end of the reporting period. Number of new residential dwellings (≥1 family per unit) constructed by the client company at the end of the reporting period. Value of company’s purchases of goods and services from domestic suppliers (including raw materials, security, gardening, cleaning and marketing & research from local companies) during the reporting period. Number of fixed data subscriptions (ADSL, Broadband, Fibre, etc.) at the end of the reporting period. Includes both post-pay and pre-pay subscriptions. Number of fixed voice (telephone) subscriptions at the end of the reporting period. Includes both post-pay and pre-pay subscriptions. Number of mobile subscriptions (GSM, CDMA, BGAN, VSAT, EDGE, UMTS, WiMax, 3G, 4G, LTE, etc.) including voice and/or data at the end of the reporting period. Includes both post-pay and pre-pay subscriptions. Number of full-time equivalent construction workers employed for the construction of the investor’s client company orproject’s hard assets during the reporting period. Part-time jobs for construction are converted to full-time equivalent jobs on a pro rata basis, based on local definition (e.g., if working week equals 40 hours, a 24 hr/week job would be equal to 0.6 FTE job; a full-time position for three months would be equal to a 0.25 FTE job if the reporting period is one year). If the information is not available, the rule-of-thumb is two part-time jobs equal a full-time job. Note: employment for the operations and maintenance of an investor’s client company is not to be included in this indicator. For such jobs, please use the indicator Direct Employment – Operations and Maintenance. Number of full-time equivalent employees as per local definition working for the investor’s client company or project at the end of the reporting period. This includes directly hired individuals and individuals hired through third party agencies as long as those individuals provide on-site services related to the operations of the client company. Also, this includes full-time equivalent worked by seasonal, contractual and part time employees. Part-time jobs are converted to full-time equivalent jobs on a pro rata basis, based on local definition (e.g., if working week equals 40 hours, a 24 hr/week job would be equal to 0.6 FTE job). Seasonal or short-term jobs are prorated on the basis of the portion of the reporting period that was worked (e.g., a full-time position for three months would be equal to a 0.25 FTE job if the reporting period is one year). If the information is not available, the rule-of-thumb is two part-time jobs equal a full-time job. Note: employment for the purpose of the construction of the hard assets of an investor’s client company is not to be included in this indicator. For such jobs, please use the indicator Investee Direct Employment – Construction Phase. Number of investments and volume of invested capital on a cost at investment basis at the end of the reporting period. Definition: The client adopts or operationalizes a product, internal process, technology or financing structure that is new or not widely used in the domestic sector. Note that “product” includes both physical goods as well as financial products while “domestic sector” can refer to the national market in small countries and regional markets in larger countries. Innovations in supplier or client relationships are covered in the Market Linkages Improved or Expanded Indicator. IFIs who wish to gather additional information on the quality of the result reported may use ‘commentary’ to do so. Rationale: The indicator captures the adoption or operationalization of innovative business practices, ranging from the financial structuring of the client company to the business processes it uses to deliver products/services. The indicator can be used to track innovative technology transfer without qualifying from where the technology originated. IFIs may wish to undertake more detailed assessment/monitoring of certain aspects of client innovation, but this serves as a good overall capture of innovation. Definition: The client improves existing or engages new kinds/additional forwards or backwards market linkages, including through its own integration. Note that forward/ backward refers to upstream/ downstream supply chain linkages rather than commodities contracts. Also note that Note that “improved” refers to those linkages that the client believes will provided an added-value to its market expansion whether this is because of improvements in technology- use or cheaper/faster service delivery. IFIs who wish to gather additional information on the quality of the result reported may use ‘commentary’ to do so. Rationale: This indicator tracks IFI client’s improvement of existing or acquisition of new kinds of forward or backward market linkages. The client directly uses these linkages to expand market access. 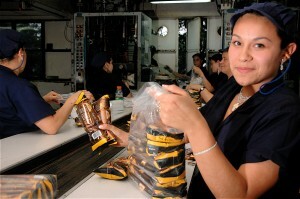 Examples of forward linkages include the sale of value added services and goods to other firms, such as for example the supply of fertilizers by manufacturing companies to agricultural firms, or customers, while backward linkages include the purchases of inputs from suppliers and service providers, for example sourcing raw materials for manufacturing or agro-processing among others. These linkages may be developed using licensing agreements, supplier sources, international sourcing/distribution, etc. This indicator varies from 'Business Innovation,' which only aims to track the development of innovative products and services by the client. Definition: The client expands operations and increases market share in a concentrated market in which the client is not a dominant player. Note that "dominant" and “concentrated” should be defined by the IFI based on the context in which the client operates. For example, in some markets, a dominant firm may have over 50% of the market share while in another, a firm may be dominant with only 20% of the market share. Market concentration is determined by the number of firms in a market and their respective share of the relevant market. Hence, a “concen- trated” market typically features fewer firms with larger market shares, with or without a dominant player. IFIs who wish to gather additional information on the quality of the result reported may use ‘commentary’ to do so. Rationale: This indicator captures another level of an IFI client’s contribution to market competition namely, by expanding existing share of a market. This indicator varies from the ‘New Market Entry’ indicator, which applies to IFI clients who have just entered the relevant market. Hence, only one of these two indicators can be applicable to an IFI client at one time. Definition: The client enters a new market. Note that “market” refers to the relevant market and varies by country, sector, product and targeted beneficiaries. “Entry” is only relative to the client's own operations, and is denoted by establishment and commencement of sales. IFIs who wish to gather additional information on the quality of the result reported may use ‘commentary’ to do so. Rationale: This indicator captures one level of an IFI client’s contribution to market competition namely, by entering a market. This indicator varies from the ‘Market Share Increased’ indicator, which applies to IFI clients who expanded their own market share. Hence, only one of these two indicators can be applicable to an IFI client at one time. Rationale: This indicator captures a straightforward measurement of use of IFI investments, expressed as total number of vehicles using a road, and is reported annually. This utilization level may also be expressed for varying time periods (utilization per day, month, etc.). Utilization level of a road, particularly over time, serves as a proxy for the qualitative contribution of new transportation infrastructure to economic activity. Tonnes of bulk cargo transported through the road/railway/port/airport over the last reporting period. Twenty foot equivalent units of cargo containers transported through the road/railway/port/airport over the last reporting period. Passengers using transportation service over the reporting period. Amount of waste disposed over the reporting period. Volume of wastewater treated over the reporting period. Definition: Additional private sector firms have entered the relevant market in which the client operates. Note that this indicator only applies in circumstances where PSD firm level competition indicators are applicable. IFIs who wish to gather additional information on the quality of the result reported may use ‘commentary’ to do so. Rationale: This indicator seeks to capture an aspect of increased competition that may be related to the success of the client company. However, the observation of entry of new firms should not be attributed directly to the client’s activities and nor is it fully attributable to IFI interventions. This indicator is applicable only if the IFI client is expected to attract other firms to the same market, and it should only be used if one of the firm-level PSD indicators “Market Entry” or “Market Share Increased” are used for a given client. However, it should be noted that the indicator may be tracked annually (throughout the project cycle) or in an evaluation/survey method. Increased competition in the relevant market is often manifested by an increase in product or service quality or a decrease in product or service price, though these do not always indicate entry of new firms and may also result from the reaction of existing players in the relevant market to the new entrant. However, note that the entry of new firms into a market is easier to measure as compared to a change in strategy/positioning of existing firms in the relevant market. Data for this indicator may be sourced by IFI clients who are able to report on the number of competitors in their respective markets (timing to be determined by the IFI) as this is an exercise any such entity would undertake as part of its operations. If needed, the IFI may then conduct market research to verify the data reported by the client.